At Shirley Paris Jewellery we offer bespoke jewellery design so that our customers can own remarkable pieces that are tailored to their own unique style. By choosing Shirley Paris Jewellery for your bespoke design, you are guaranteed to receive a one of a kind piece, made to the highest quality, that you will treasure forever. Each client is unique, so when you meet with us to discuss your custom jewellery, we take the time to understand your style and personality. Diamonds and gems are our passion. We can guide you through our collection of coloured stones, and advise on how to choose the perfect diamond. Alternatively, if you have a specific gem in mind we can source it for you. Visit Sourcing Gemstones to learn more about this service. We love keeping up with trends while maintaining our in-house style, so we often introduce and display new pieces instore that our clients can be inspired by. 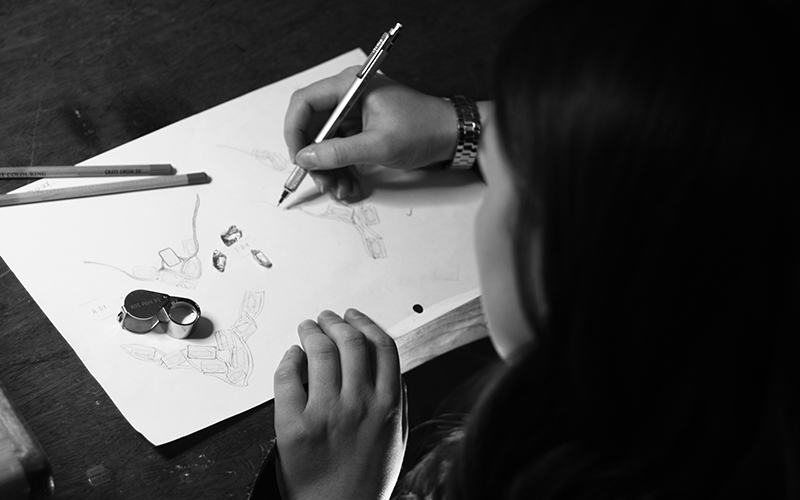 Along with sketches from your designer, we encourage you to try pieces on to help visualise your new bespoke pieces of jewellery. All of our jewellery is designed by our on-site designers Shirley and Hannah, who are both members of the National Association of Jewellers. Our expert team have a combined experience of over 35 years and flourish at the chance to push the boundaries of jewellery making to deliver stunning pieces that are entirely unique. Need some inspiration? Visit the Gallery to view all of our bespoke commissions. Shirley and Hannah, along with a few other industry experts, work together to provide customers with a fantastic bespoke jewellery design experience. Our workshop is joined onto our store. Just a few short steps away from where designs are created is the jeweller’s bench. This is where we create your custom-made piece. You may hear lots of clashes of metal and drilling murmers during your visits; these are the sounds of a busy workshop where precision and skill ensures the best quality piece is made. Shirley Paris Jewellery is located in the town of Larkhall, which is around 14 miles southeast of Glasgow. It is easily accessible from Glasgow city centre, for anyone looking for bespoke jewellery in Glasgow. We are very proud that all of our jewellery is designed and made in Scotland. When visiting our store, or browsing our website, you will find plenty of pieces that pay homage to our Scottish roots. If you would like your bespoke jewellery design to feature Scottish themes, please let us know. One of our most sought after services is custom made wedding rings and engagement rings. The symbolic importance of an engagement ring or wedding ring is immeasurable, which is why many people prefer to have their ring custom made. We can create a bespoke ring design for you or your significant other based on the information you give us. Alternatively, we can incorporate materials from sentimental pieces of jewellery. Visit Jewellery Remodelling to learn more about this service.